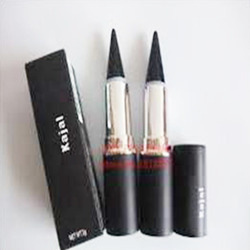 In this type, Kajal is filled in plastic container like Lipstick containers in conical shape. Where the bullet can be taken up when use it by retractable mechanism and after use it can be taken back to its basic position to avoid damaging of bullet. Milap’s premium new generation formula with olive oil, esters, cocoa butter, vitamin E and C derivatives. Onyx kajal has our deepest black pigments, a unique tip and exclusive colour fix formula which gives you smooth , intense black colour that stays on upto 12 hours. it is lab tested , smudge proof and suitable for contact lens wearers. - The independent and confident women of today do not require constant adulation from the other . They love themselves and know how to use their kohl-rimmed eyes when required. A stroke of this Maybelline Colossal Kajal and they are ready to take over the world. The ultimate combination of ingredients like almond oil, wheat germ oil, jojoba oil, triphala, amla & punnarnava extract nourish and relaxes the eyes. Available in 1 shade; Flesh tone. A Camouflage pencil for smaller areas or it can also be used as neutral lip liner pencil. A helpful tip; to make small eyes look bigger, use it inside the eyes instead of a kajal pencil.